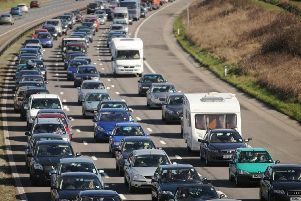 Delays are expected on the M6 due to a series of accidents. One lane has closed on the M6 Southbound between junctions 26 (Orrell Interchange) and 25 (Brynn) due to an accident. Lanes were also closed earlier on the M6 southbound and northbound between junctions 30 (M61) and 29 (Lostock Hall) and 31a (Longridge) and 32 (Broughton) after accidents. Two lanes were also closed on the M6 northbound, J41 - J42 following an earlier HGV fire.